Many people disapprove of the phrase Xmas �| the original use was not disrespectful �| it was based on X being the first letter of Xristos, the Greek name for Christ. King Richard II of England served 28 oxen and 30 hundred sheep at his 1377 Christmas feast! Rudolph the Red-Nosed Reindeer was written by Robert L. May as a promotion for Montgomery Ward. They distributed six million copies of the story between 1939 and 1946 alone. The song, written by Johnny Marks, came along in 1949. According to The Macaulay Institute in Aberdeen, Scotland, reindeer can haul up to twice their weight at speeds up to 15 miles an hour, making them great sleigh pullers. Over 70 million Americans give their dog or cat Christmas presents, according to an American Pet Association poll. "Jingle Bells," one of the most popular holiday songs in America, was the first song ever broadcast in space, thanks to the crew of 1965's Gemini 6 spacecraft. Frigg is the name of the Scandinavian love goddess who removed poison from mistletoe, bringing her son, Baldur, back to life. She was so happy, she made mistletoe a sign of love �| so now people make "Kissing Balls" of mistletoe. The traditional Christmas ham began with the Norse custom of sacrificing and eating a pig to honor their god Freyr. When it's winter solstice in the Northern Hemisphere, the sun is directly overhead at noon only along the Tropic of Capricorn - Sao Paulo, Brazil, southern Madagascar, and areas north of Brisbane, Australia. Caroling, feasting, and gift giving along with the prayers and wishes - the Christmas is celebrated with high spirits all over the world. Though the mode of celebration, the dates and the traditions vary, the main spirit remains the same everywhere. For instance, the Christmas flower. If poinsettia is the Christmas flower here in United States, it is white rose in the British Isles. If gifts here and in Britain are given on Christmas, it is done on New Year in France and many other countries. While most of us celebrate it as a festive season spreading over a week, for some it is a month long festival that starts with the Advent on Sunday next to November 26 and ends on January 6 with the feast of Epiphany. The Winter Solstice is the day on which suns rays reach the farthest south as the earth completes its 365-day orbit around the sun. That means that in the northern hemisphere, it is the day with the most darkness of the year. Most cultures have a traditional celebration to mark this day, or, in the days following, to celebrate the gradual return of light to their dark world. Hanukkah, or the "Festival of Light," is celebrated by Jews all over the world. Hanukkah celebrates the taking back of the Temple of Jerusalem from the Romans over two thousand years ago. When the Temple was destroyed, the lamp of the Eternal Light, which symbolized the continuation of the Jewish people, was snuffed out. Only enough oil to light the lamp for one day was found. But because of a "miracle," the lamp burned for eight days �| enough time for the temple to be rededicated. Hanukah is celebrated with a menorah �| a lamp holding eight candles �| to symbolize this miracle. On each of the eight days of Hanukkah, a candle is lit. There is no special feast, but traditional foods �| especially latkes �| are served. Latkes are fried potato pancakes. Friends and extended family are usually invited to the celebration, which usually includes the singing of Hanukkah songs. Children sometimes exchange gifts and often receive "Hanukkah gelt," or coins. They also play a game with a "dreidel," or spinning top with four flat sides. Optional: This step makes the dreidel sturdier (but it will be more difficult to cut out). Glue the printed template to a piece of very thin cardboard (like cereal box cardboard). Let the glue dry. Decorate the dreidel, then cut along the edges. Cut an x in the tiny circle on the top Fold along the inside lines, making a top shape. Glue the flaps inside the top. Stick a straw or wooden dowel through the tiny circle at the top (push it gently to the bottom of the dreidel). Now you can play dreidel. Each player starts with about 20 markers (like chocolate coins, checkers, nuts, or raisins) and takes turn spinning the dreidel. On each spin, the players put 2 markers in the center. Cut down a milk carton so that only the bottom two inches remain. Make a tiny hole in the center of the bottom of the carton through which a pencil can be poked. Glue strips of blue paper to the sides of the carton and label each side with a letter: N (for nothing), G (for all), H (for half), and S (for put). Poke a pencil through the hole in the carton and practice spinning the dreidels. Paint the wider ends of the wooden craft spoons (fronts and backs) to resemble yellow-orange flames. Use a craft knife to cut a 3/4 inch slit in the bottom of nine of the paper cups. Cut the bottoms out of the remaining five cups and stack them rims down. Line up the nine cups in a horizontal row, placing the middle one atop the stack of five. When it is time to light the menorah, simply insert the bottoms of the wooden flames in the holes in the candles (cups). Kwanzaa is a non-religious holiday that celebrates African-American culture. It is based on various African harvest festivals. Kwanzaa lasts for seven days; it starts on December 26th, and ends on New Year's Day. The word Kwanzaa means "first fruits" in Swahili. Maulena Karenga, an African-American scholar and activist, founded Kwanzaa in 1966. Honoring the past (especially the history of Africa) and one's ancestors is central to Kwanzaa. Some communities collect food and clothing for the homeless during the seven days of Kwanzaa. On the seventh night, there is a feast to which friends and extended family members are invited. There are traditional foods, and cards and gifts are exchanged (although the giving of expensive commercial items is de-emphasized in favor of simple, handmade gifts). There is also singing and dancing. People greet each other with the Swahili expression "Habari gani," which means "What's new?" This is followed by a response that relates to one of the seven principles. Make a place mat to decorate your Kwanzaa celebration table. These simple-to-make woven construction paper place mats represent a straw place mat (called mkeka in Swahili). Start with a large piece of construction paper. While the paper is still folded, draw a series of lines across the fold, but do not draw them all the way to the edge - leave about 1 inch at the edge. For a very neat-looking place mat, use a ruler to draw the guidelines. When you're finished cutting, unfold the piece of paper. Using other colors of paper, cut many strips of paper about an inch wide, and the same length as the height of the large piece of paper used in the last step. 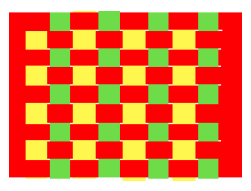 Start weaving the strips of paper onto the large piece of paper. Make sure that each new piece of paper is pushed up next to the previously woven piece. When you're done weaving, secure each strip of woven paper using glue or tape. You might also have to trim the woven edges a bit to make the edges of the place mat even. You can now use your place mat at your Kwanzaa celebration table. Make candles (called mishumaa in Swahili) containing secret treats to decorate your Kwanzaa celebration table. Cover the toilet paper roll with construction paper (choose a different color for each candle you make) securing it with tape or glue. Cut two squares of tissue paper about 12 to 14 inches on each side and stack them on tope of each other. Offset the two papers so that you have 8 points. Then put your finger in the center of the tissue paper and gather the points up to form a cone-like shape. Gently push the center of the tissue paper into the toilet paper roll. The eraser end of a pencil may help. Fill the tissue-paper-lined tube with small treats. Santa Claus is known in different ways around the world. Boys and girls in Germany call him St. Nicholas, and they have a special day for him on December 6. On the evening of December 5, he visits all German boys and girls in their homes and ask them questions about how well they are doing in their school work, whether they attend church regularly, if they behave well for their parents and teachers, and if they are lazy or slow in doing things they are asked to do around their homes. He visits them on his special day, December 6. All of the children leave one shoe out for St. Nicholas to either leave candy if they are good or twigs if they are bad. In German culture, beginning in the Black Forest, families make Advent Houses to count down the days until Christmas. Starting on December 1st, with the entire family present, a window in the house is opened. Behind each window is a scene depicting some aspect of the Christmas season. The candle in the center of the house is lighted, and its light shines through the cellophane window. On December 24th, Christmas Eve, the front door of the Advent House is opened to reveal a scene illustrating the night before Christmas. Enlarge pattern to fit on 11"x14" paper. Cut open 23 windows and front door (an X-acto knife works well). Draw and cut out 24 pictures depicting Christmas to go behind windows and door. Door scene could be Santa or nativity scene. Cut cellophane to fit behind windows allowing a slight overlap for a place to glue. Close shutters with a stick-on star. Fold house on fold lines. You may color the roof and glue onto the tabs on the house. Or cut tongue depressors and glue them in the pattern shown, then glue roof onto tabs. Cut a slit in the roof for the chimney (see pattern). Cut, fold, and glue chimney according to pattern. Insert chimney in slit about one-half inch. Advent is celebrated the four Sundays before Christmas. This is a time set aside to prepare for the coming of the Christ Child who brings gifts on the Eve of Christmas. German families have a circle of greenery with four candles in the center that sits in the middle of their table. The first week, one candle is lighted, the second week two candles, and so forth until all four candles are lighted, heralding the many lights of the Christmas tree which are to appear in but a few more days. 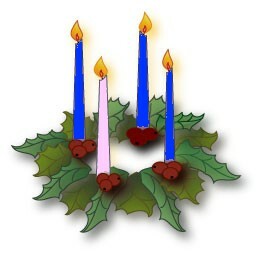 Traditionally, purple (for repentance) candles were used, and more recently, blue (for hope). Fold the paper plate in half and cut the inside out leaving only the rim. Fold a piece of green construction paper in half and in half again the long way, then open the paper and cut on the lines. Then take each strip and fold it in half and in half again, then open and cut. This will make 16 rectangular pieces. Fold these 16 rectangular pieces in half once again, and draw the shape of a leaf on each piece. Cut the leaves out, and each piece will have two identical leaves. You may draw in the veins using pencil, crayon, etc. These leaves are then glued to the paper plate. Cut additional leaves as needed. Fold a half-sheet of violet, red, or white construction paper in half and in half again lengthwise, then open it and cut. The result is four long, rectangular shapes to be used as the candles. Yellow construction paper is used for the flames, following the same procedure as for cutting out the green leaves. Attach a piece of yarn to the back of the wreath for hanging. The Christmas tree is another tradition that originated in Germany. In such a cold, wintry country, the evergreen was loved as a symbol of hope for the returning of the green of summer. Trees were cut and brought inside where the boughs were decorated with lighted candles. Before the glue dries, sprinkle with green glitter. Top with a paper star. When the glitter and glue dries, you can glue on sequins or tinsel. Glue onto the button or wooden disc for a mini-Christmas tree on a stand. Or hang as an ornament by adding a ribbon. 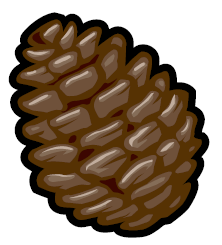 If you cannot find open pine cones, place some in a 200 degree oven on a cookie sheet. They will open as they dry. Make a hole towards the top of the design. This is where you will hang the ornament. Using a nail, make indentations to decorate the cut-out. Attach a string to the hole near the top. You now have great aluminum decorations for any occasion. Throughout the month of December, people busy themselves preparing for the Christmas festivities. There are the mince pies and Christmas cakes to bake and decorate as well as the all-important Christmas pudding. In England over the years many superstitions have surrounded this popular festive dessert. It is said puddings should be made by the 25th Sunday after Trinity, prepared with 13 ingredients to represent Christ and His Disciples, and that every member of the family take turns to stir the pudding with a wooden spoon from east to west, in honor of the Three Kings. A silver coin is always dropped into the pudding mixture before it is cooked. This is said to bring wealth, health and happiness to whomever is lucky enough to find it when the pudding is cut. Children hang stockings on the fireplace or at the end of their beds so when Father Christmas pays a visit, they are stuffed full of goodies, but only if they have been good! Children also send letters to Father Christmas, which legend has it, if they are tossed in the fireplace, the smoke from them burning gets carried up the chimney directly to the man in the red suit! In the days leading up to Christmas, groups of carol singers holding candle lanterns, dressed in their hats and scarves to fight off the cold, go from door to door performing traditional Christmas songs for a small charitable donation to their cause. On Christmas Eve night, children leave out a glass of brandy and a mince pie for Santa, and a carrot and bowl of water for the reindeer. The Irish celebrate very much like the English. In addition, in many areas, on Christmas Eve, a lit candle is placed in a window (nowadays it can be an electric light!). This goes back to traditions of hospitality in ancient times. The idea is to help light the way of the Holy Family or any other poor traveler who is out on that night. Day and why it is celebrated. The first is that centuries ago, on the day after Christmas, members of the merchant class would give boxes containing food and fruit, clothing, and/or money to trades people and servants. The gifts were an expression of gratitude much like when people receive bonuses, from their employer, for a job well done, today. These gifts, given in boxes, gave the holiday it's name, "Boxing Day". 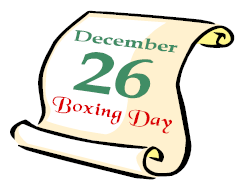 These days, to keep the tradition of Boxing Day alive, many businesses, organizations, and families donate their time, services, and money to aid Food Banks and provide gifts for the poor, or they may choose to help an individual family that is in need. What a great extension of the Christmas holiday spirit. You might consider making this holiday a tradition in your family. No matter where you live the simple principle of giving to others less fortunate than yourself can be put into practice. In France, Father Christmas is called Pere Noel and he travels in the company of Pere Fouettard. Pere Noel leaves presents for good children, while Pere Fouettard disciplines bad children with a spanking. They leave a snack and a glass of wine for Pere Noel and beet greens for the donkey that travels with him. Pere Noel is tall and thin. He has a long red robe trimmed with fur. Pere Noel brings toys to children in a sack. As he comes, he calls out "tralala, tralala, bouli, bouli, boulah." Families go to church at midnight on Christmas Eve. After church everyone eats a huge dinner called "Le Reveillon." After this large dinner of goose, turkey, chicken, or beef; a fish dish, cheese, bread, wine, and fruit, many families serve a "Buche de Noel." The Buche de Noel is a sponge cake decorated like a Yule log. Some families burn a real log in the fireplace. French families think that mistletoe is also lucky and hang it everywhere. Nativity Scenes are very common. In fact, Mexicans revere the Nativity so much that they recreate it with "Las Posadas". This is a time of grand celebration and gathering. Many people take part in a reenactment of the Birth of Christ. From some churches, the priest and other believers accompany disguised children who represent Joseph, Mary and some shepherds. They go from door to door and sing popular folk songs asking for a place because �eMary is going to give birth', and from inside the house the children are answered with popular folk songs denying them the entry, as it happened in Bethlehem according to the Bible. Finally, a door opens and Holly Family may enter. Many will also attend "Pastorelas" or plays about the shepherds and their visit from the angel. In the spirit of a warm holiday, the outdoor markets offer sunny shopping and cool Christmas crafts. And to think, all these festivities last through 9 days! On Christmas Eve, kids can expect a visit from "el Ni-o Dios". The Holy Child brings gifts to the good girls and boys. Then on January 6, the three wise men come to visit for "Reyes Magos". The Magi leave more gifts for the children, sometimes in their shoes! To decorate for a Mexican Christmas, be sure to add some of the beautiful red poinsettias or "La Flor De Noche Buena". They have been a Christmas tradition throughout much of the world since an American ambassador introduced it to South Carolina in the 1820's. A well-dressed Mexican Christmas home would also have to have a pinata! As part of the fun, the children gather around and smack it with sticks until they are showered by the candy explosion! For the basic body, inflate a 10" balloon, tie a knot in the end and attach a string. Suspend the balloon by tying the string to an object inside or outside. Be sure it isn't near anything that will cause it to burst. Cover the balloon with several layers of newspaper papier-ma^che�L strips. Let it dry. Two or three layers of papier-ma^che�L are adequate. Let dry completely. Tape on additional balloons and cardboard pieces for head, legs, ears, wings, etc. Cover with two layers of papier-ma^che�L. Insert a bent clothes hanger as a hanger for the pinata. Cover with additional layer of papier-ma^che�L to hold it in place, and then let it dry. After the pinata is completely dry, cut a hole in the back to remove the balloon and add wrapped candy or party favors. Hang it from a tree or other object so it swings freely. Blindfolded participants take turns hitting at the hanging pinata with a stick until it breaks and the goodies fall out. For an added challenge, hang the pinata from a cord or rope that someone can pull on so that the pinata moves up and down, making it harder to hit! Wad the used tissue paper into balls to make stuffing. Fill the brown bag with the stuffing and treats. Cut crepe paper into strips for streamers. Tape or glue streamers to bag. Twist the streamers together to make a hanging loop. Hang pinata in a spot where there is lots of room for treats to fall and children to scramble after them. Take turns with the stick until the pinata is broken. In Italy Christmas begins on 1st of December with the construction of the "Presepio" or Nativity. Many countries set out figurines of Mary, Joseph, and the Baby Jesus, but the Italian presepio is much larger. At the center is a big hut or stable with Mary, Joseph, Jesus, a donkey and the three kings that brought gold, frankincense, and myrrh. Outside the stable there are shepherds, with sheep of course, fishermen, curious towns people, some angels, houses, lights, little lakes usually make of blue-colored aluminum foil, with everyday animals like geese, dogs, horses, and so forth. The blacksmith is working in his g his bread, and so forth. Italian children do not hang stockings at the fireplace for Santa, instead they believe that the Baby Jesus comes to their houses in person to bring them presents. On Christmas Eve, parents give their children corn for Jesus' camels and a glass of milk and cookies for him. In the morning, the goodies are gone, and presents are in their place. In Australia everything is topsy turvy since Christmas is in the middle of summer. But the Australians have a great time anyway, exchange Chrissie presies (not sure I have the spelling right, but those are the words) with each other, and often enjoy a barbie (not the doll, but a barbecue) on the beach on December 25th. And they have a good laugh about it all, and celebrate their differences, as they do many things, with a joke on themselves. St. Nicholas day was celebrated formerly in Russia, but under Communism, he was changed to Grandfather Frost and wore blue instead of red. In the Netherlands, legend has it that Sinterklaas (St. Nicholas) arrives in the Netherlands by way of steamboat from Spain two weeks before his traditional birthday, December 6th, along with his helper, Zwarte Piet (Black Pete), who will help disperse the gifts and candy to all the good children. Sinterklaas, accompanied by Zwarte Piet, goes abroad at night and strides about the countryside wearing his red mantle, his mitre, and his golden crosier and sporting a long, white beard. Referring to his book that lists all the good and bad children, Sinterklaas will deliver pto all the good children, but watch out if you've bebad! The bad children may be taken back to Spain with him. In anticipation of Sinterklaas's nightly visit, children put their shoes in front of the fireplace. They sing traditional songs and provide a carrot or hay for Sinterklaas's white horse. At one point in the evening before St. Nicholas's birthday, a loud knock will herald his arrival and at the same time candy may be thrown from upstairs; when the door is opened, a bag of gifts will be on the doorstep. At night Black Pete puts gifts and candy in the shoes. Prior to Christmas, a custom known as Midwinter Horn Blowing is still practiced in parts of the Netherlands. At dusk, farmers take long horns made from elder trees and blow them to announce the coming of Christ. Saint Martin's Day is on November 11th and is celebrated in Holland. Children carry lanterns and go from house to house singing songs. People give them candy and other treats. Here is a song they sing to the tune of "My Bonnie Lies Over the Ocean:"
And eased some of the beggar's woes. Martin was a good and kind man. On a winter night he was returning home during a snowstorm. He was wearing a clock A homeless man appeared in the darkness. Martin felt sorry for the man and gave him half of his cloak. Now he is called St Martin and is known for his kindness to strangers. That is why Saint Martin's Day is celebrated in Holland. Notes: Prior to the activity, fill one tin can per child with water and freeze overnight to make it easier to puncture holes in the tin. Make lanterns outdoors or indoors on a plastic sheet. Keep sponges and a bucket handy. Use a hammer and nail to punch a hole on either side of the can's open end. Punch more holes all over the sides of the can. When there are enough holes, empty the ice into the bucket and turn the can upside down to dry. To make a handle, push the wire through the first 2 holes made on the can. Twist the wire together at each hole to keep it in place. 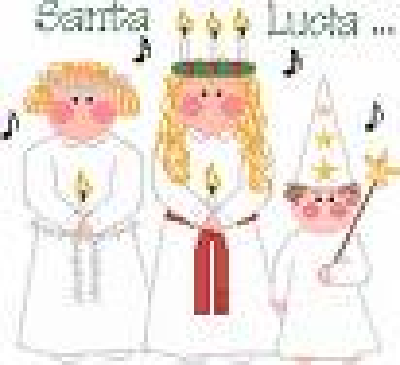 St. Lucia Day is celebrated on December 13. The story behind the holiday is of a young Sicilian girl who lived over 1,700 years ago. She would not deny Christianity so she was punished and her eyes were put out. She is pictured as wearing white robes and wearing a crown of light. The light represents the breaking of the winter spell and bringing light into the world. Cut a hole in the center of a paper plate so that a child's head will fit in it. Cut out leaves from green construction paper and have children glue them to the paper plate. Make 7 paper candles stand up around the inside rim of the plate. Cut an 18 inch wand from cardboard. Cover it with construction paper. Make a white star on the end of it. To make the hat roll a piece of construction paper so that it has a point on the end and staple it in place. This holiday is celebrated in Thailand in November each year. "Loy" means "to float" and a "Krathong" is a lotus-shaped vessel made of banana leaves. The Krathong usually contains a candle, three joss-sticks, some flowers and coins. Make a paper boat to launch. Boats in Thailand have flowers and candles on them. Think about what bad feelings or happenings you would like to put on the boat to send away. Try floating your boat on a nearby stream, canal, or even in the bathtub. Although it was originally a Hindu celebration, Diwali is now enjoyed by people of every religion in India. It is a family celebration which takes place in October or November and lasts for five days. This festival of lights celebrates the victory of good over evil and the glory of light. During Diwali, Indians buy puffed rice to offer to Lakshmi, the Goddess of Prosperity. Have students put one cup of puffed rice in small squares of plastic wrap. Tell them to hand the rice out to friends. In India a design using rice flour is made on the floor in front of the family's shrine. Make your own Rangoli design! Use white chalk to draw a design on black construction paper. Color in the design with colored chalk. Spray the finished designs with a fixative.